There were no injuries as a result of the fire but the restaurant said it would be closed until further notice. DUBLIN FIRE BRIGADE attended a blaze earlier today at the popular Japanese café Yamamori Izakaya on South Great George’s Street. The fire started in the basement area of the building, which has a Japanese café on the ground floor and a bar downstairs, at around 1.30pm today. It is understood that there was significant damage to the basement area in two rooms with four units of the fire service attending from Dolphins Barn and Tara Street. A number of guests from the Central Hotel, which has rooms above the restaurant, were evacuated because of smoke seeping into the rooms but a spokesperson said the fire officer checked all rooms after the blaze was extinguished and everyone was allowed to return to the hotel. There were no injuries reported but the restaurant told customers it would be closed “until further notice”. 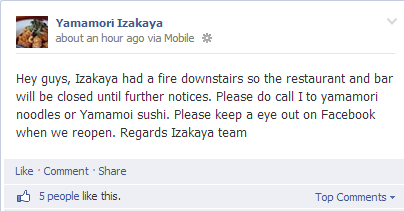 Email “Fire shuts down popular Japanese restaurant in Dublin”. Feedback on “Fire shuts down popular Japanese restaurant in Dublin”.